As I said good-bye to an odd and baffling season for one Aquillini asset, I had an opportunity to eat at a newly (albeit also odd) acquired Aquillini property. Whenever a new owner comes into a successful restaurant I always worry that the quality of the food will take a nosedive; such was the case when I entered Blue Water Café. My ingrained bias for seafood is the Cantonese way: whole (to ensure you are getting what you paid for) and simple (to let the subtle sweet flavour of the seafood standout). However, if it must be non-Asian seafood, then Blue Water Café is an excellent and tasty choice. This was a company meal organized and paid for my food adoring boss (yes I know how lucky I am). As a result I was able to try lot of dishes, as we shared almost everything we ordered. 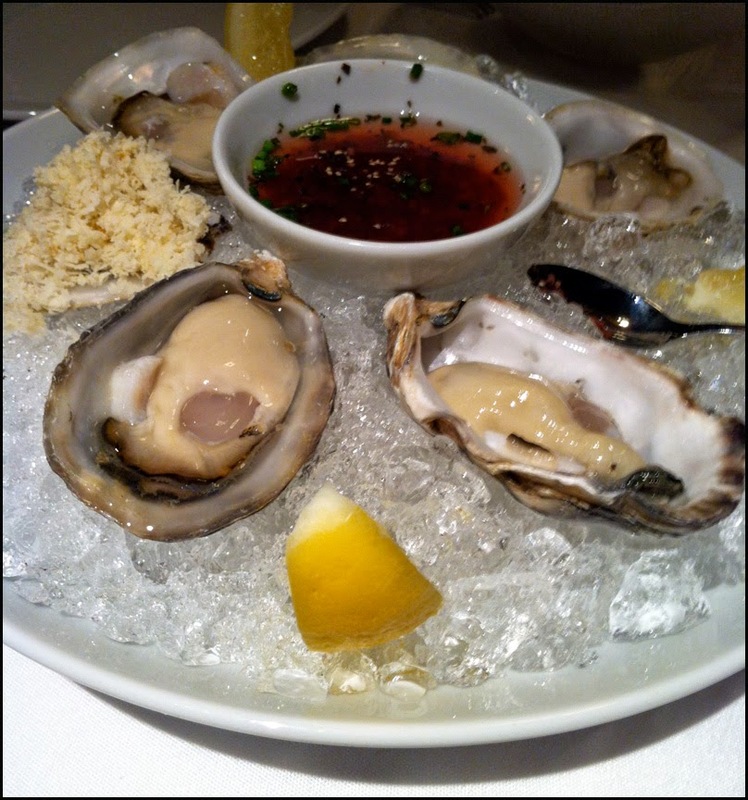 We started off with raw appetizers: half a dozen of oysters, a seasonal special of Halibut Carpaccio and the Tsunami. I believe the oysters were local Kusshi oysters (our company’s resident oyster expert selected the variety for the table). 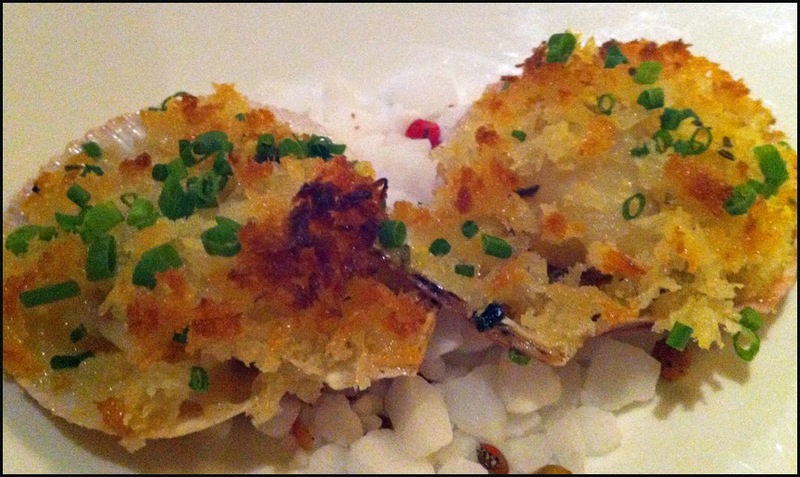 They were fresh, shucked correctly and served with a simple mignonette and horseradish. I’m not an oyster expert but they tasted clean and sweet. The Halibut Carpaccio looked stunning; with thin translucent slices topped with I think arima zansho (pickled Arima pepper seeds) and a vinaigrette. However taste wise, I felt the delicate white fish was overwhelmed by the flavours of the other components. Of the 3, the Tsunami was the star; its torched Hamachi was delicious. The fish’s fatty flavor was complimented nicely with ginger and sesame oil sauce. Unlike the halibut, the naturally stronger flavour of the Hamachi stood tall and was not overpowered by the other ingredient of the dish. For the appetizers that had cooked ingredients, we ordered another special, the candied salmon salad, and the Kurobuta Pork Cheeks. 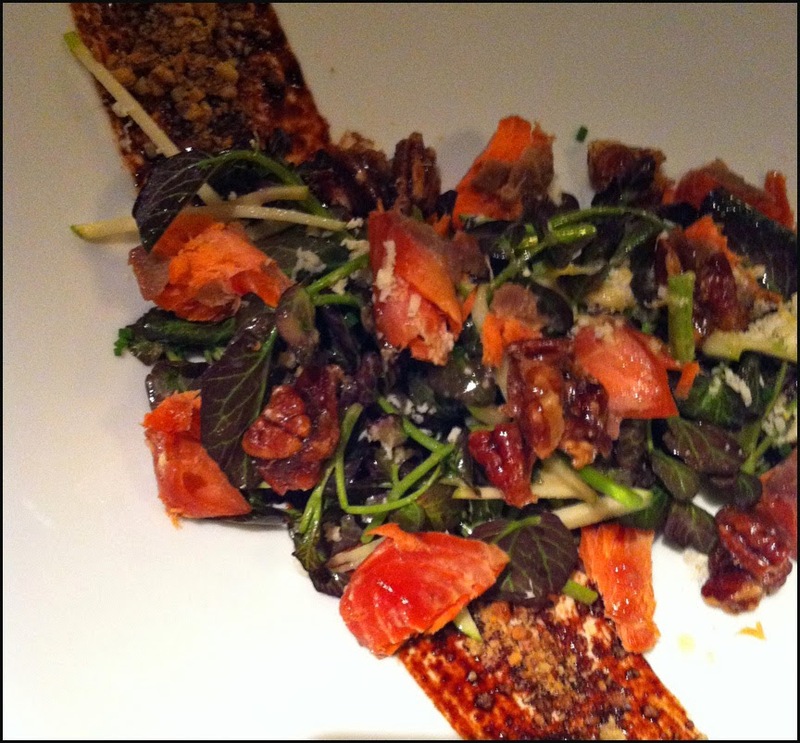 The chunks of candied salmon were delicious, soft and sweet. Although plated beautifully with quality ingredients (salad greens, walnuts) that worked well together, in the end it’s salad. You don’t win friends with salad. On the other hand I think you may be able to find a BFF with the pork cheeks dish. The cheeks were breaded, and had nice crunchy exterior and super soft interior. The pork was super tender. We easily shared the cutlet by tearing it apart with our forks. 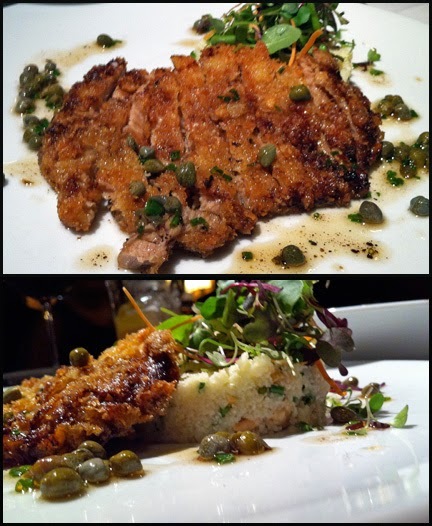 The nice sweet pork was served with a cauliflower couscous and topped with a lemon caper butter. To be honest the other components took a back seat to the pork. Before our entrees arrived, the kitchen sent out an amuse-bouche of pink swimming scallops. Our table appreciated the goodwill, however it was a bit of a “Where’s Waldo” in finding the small morsel of tender scallop under the buttery breadcrumbs. For my entrée I selected the sablefish (a.k.a black cod). 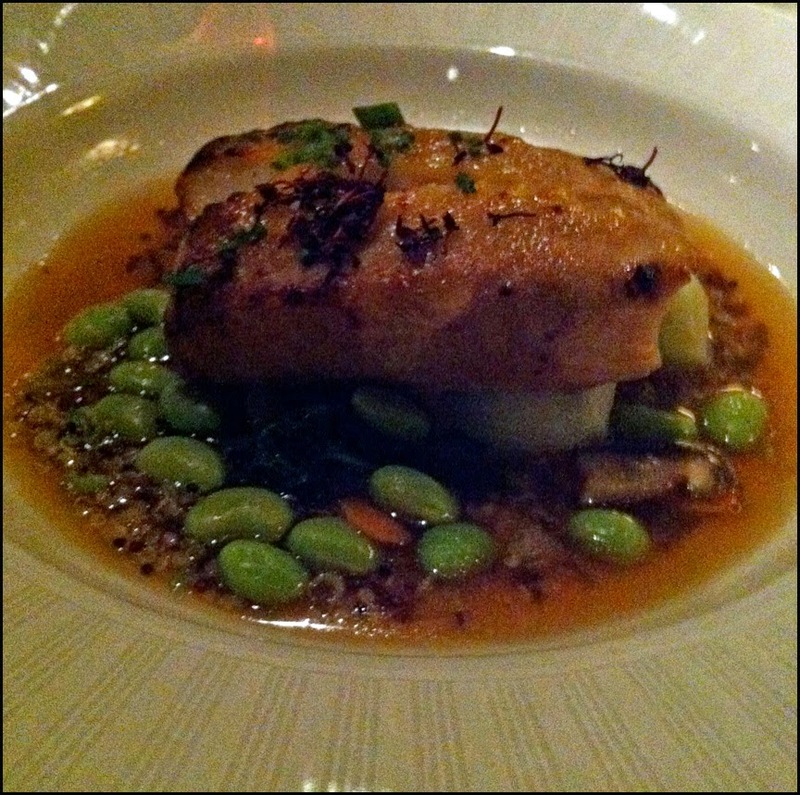 The sablefish was enhanced with the traditional Japanese pairing of miso and sake. The overall dish was Asian inspired with baby Shanghainese bok choy, edamame, shiitake mushrooms, bonito dashi broth and non-Asian quinoa. The fish was fork tender and flaked off easily. The fish was naturally rich tasting and the sweetish miso sake glaze was a nice accent to buttery flavour of the fish. Among the well prepped sides, I really liked the crunchy quinoa in the dashi broth. I was also able to sample some of my coworker’s seasonal Halibut dish. 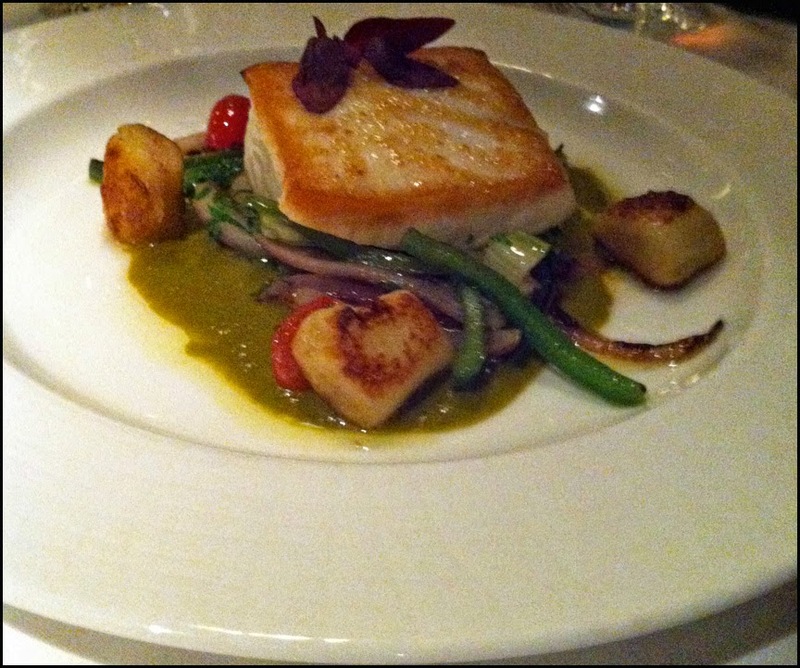 Unlike the appetizer, the cooked Halibut was awesome with its natural sweetness shining through. The gnocchi were pillow-y soft. The green pepper sauce complimented the fish very well. Finally to conclude our meal we split 3 desserts: a crème brulee, a giant macron and the third dessert eludes my memories and notes, therefore will not be discussed. 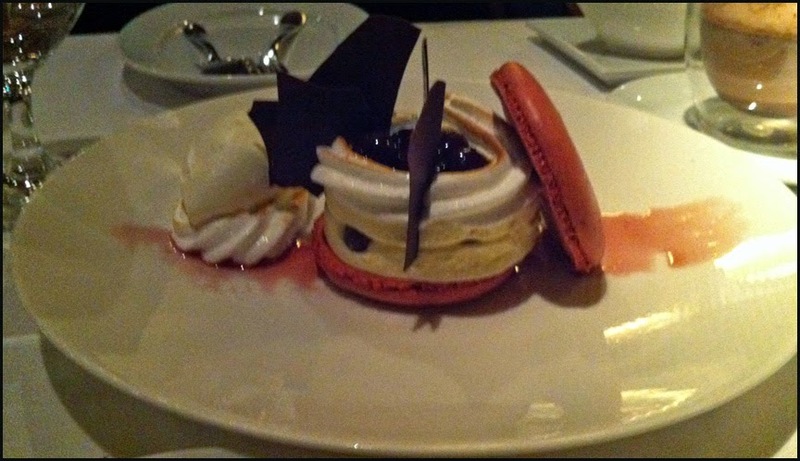 While the sablefish had a Japanese influence, the mega macaron had a pan European flare. On the menu, it’s spelled macaroon but has nothing to do with coconut confection (apparently, two “O” is the British spelling, according to the server). Inspired by a Black Forest Cake, this supersized French concoction had a German twist. All the elements of a black forest cake, cherries, chocolate and whipped cream, were present. The top and bottom of the dessert had the same crispy yet chewy texture as a regular macaron. The filling was sweet but not overwhelming as some macaron fillings can be. I really liked this interpretation of the petite French confection. As I obsessed over the macaron, my co-workers nearly finished the Creme Brulee without me. The torched dessert had a thin sugar crust and the custard underneath was not too sweet. The chocolate ice cream was creamy and was serve with a sauce that had distinct but pleasant banana flavour. Despite change in ownership, the food and service at Blue Water Café is still top notch and executed well. Although not everything I sampled was mind blowing, the fresh oysters, Tsunami, Sablefish and Halibut entrees maintains Blue Water Café as my preferred non-Asian seafood destination in Vancouver.